The long-time coach was held back by Henry's teammates on two separate occasions as he berated the freshman during a timeout. After the game, Izzo addressed the situation. "I get a kick out of you guys, get after somebody because you are trying to hold them accountable," he told reporters. "I don't know what kind of business you're in, but I tell you what, if I was a head of a newspaper, and you didn't do your job, you'd be held accountable. It's the way it is." "There's some things Aaron didn't do a very good job of and then, you know what... I did get after [him] and he did respond and he did make a couple big buckets." "This is one-and-done time. The 'my bads' are out the window. If they're 'my bads' because that team played better or that guy played better, if it's 'my bad' because I decided to jog back instead of sprint back then it is your bad and you're going to hear about it. So, that's what is was." Henry finished with eight points and three rebounds during the matchup. Despite the confrontation, No. 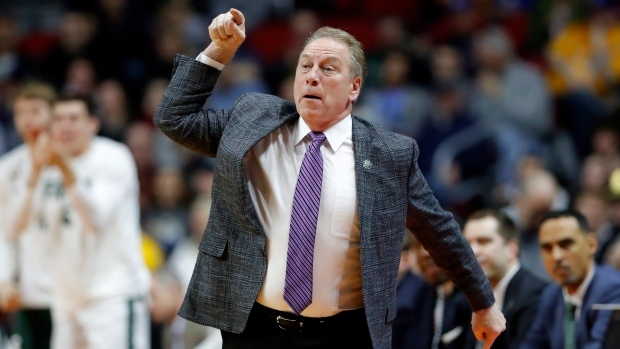 2 Michigan State prevailed with a 76-65 win and will take on No. 10 Minnesota in the second round.